The Chilkoot Trail is a 33-mile (53 km) trail through the Coast Mountains that leads from Dyea, Alaska, in the United States, to Bennett, British Columbia, in Canada. It was a major access route from the coast to Yukon goldfields in the late 1890s. The trail became obsolete in 1899 when a railway was built from Dyea's neighbor port Skagway along the parallel White Pass trail. The Chilkoot Trail and Dyea Site was designated a U.S. National Historic Landmark in 1978. In 1987, the trail was designated a National Historic Site of Canada. In 1998, the centennial of the gold rush, Chilkoot Trail National Historic Site in British Columbia merged with the U.S. park to create the Klondike Gold Rush International Historical Park. Tlingit Indians used the trail as a vital trade route to trade for resources available in the interior. As pressures from American settlers and the Hudson's Bay Company weakened the traditional Tlingit trading system, the Chilkoot Trail slowly became utilized by explorers and prospectors. The Klondike Gold Rush (1896–1899) transformed the Chilkoot Trail into a mainstream transportation route to Canada's interior. The gold rush was primarily focused in the region around Dawson City in Yukon and the Yukon River. Of the several overland routes, the Chilkoot Trail was the most direct, least expensive, and, soon enough, most popular. The other primary route to the headwaters of the Yukon River, however, was also based out of Skagway: the rival White Pass route. The White Pass route was slightly longer but less rigorous and steep, whereas the Chilkoot was shorter and more difficult. Skagway, because of its deepwater harbor, served as the principal port for both routes (nearby Dyea, the beginning of the Chilkoot Trail, was built on the extensive, shallow Taiya River delta). Prospectors who chose the Chilkoot were ferried to Dyea by small boat or ferry. Soon, both Skagway and Dyea were bustling tent cities as sensationalist headlines of the gold rush spurred men from across the United States to leave their jobs and families and gain passage up the Inside Passage to Skagway. As it became apparent that many of the prospectors who chose the Chilkoot simply were not going to survive the arduous terrain and harsh weather, Canada's North-West Mounted Police (now the Royal Canadian Mounted Police) declared that prospectors could only enter Canada if they had at least one ton of gear (enough to supply a prospector for one year. See also: Klondike supply list). Prospectors ferried the gear from campsites along the trail, slowly moving closer to the headwaters of the Yukon. With all the equipment and supplies being transported, alternative methods, especially those with a little supplemental income, sprouted up. Many prospectors purchased pack animals (although that method was more commonly used on the rival White Pass), and many others paid Tlingit Indians to haul gear on a per-pound rate from campsite to campsite. Aerial tramway companies soon were hauling tons of gear over the head of the prospectors every day. By the end of the Chilkoot Trail's heyday, there were five distinct tramway operations on different parts of the trail competing for the influx of gear and money in the region. Many of the trams constituted world-class engineering feats of the era. After the Klondike Gold Rush, the trail became more or less deserted. Prospectors late to the gold rush now made their way to the Yukon on the new White Pass and Yukon Route narrow-gauge railroad, which took them all the way to Whitehorse, Yukon in the Yukon Territory. In 1969, the U.S. and Canadian governments jointly declared their intention to make Chilkoot Trail a component of a Klondike Gold Rush International Historic Park. The U.S. portion was eventually established in 1976 as Klondike Gold Rush National Historical Park, comprising part of Pioneer Square in downtown Seattle, Washington, various sites throughout Skagway, Alaska, the abandoned town site of Dyea, Alaska, and the U.S. portion of the Chilkoot Trail. The Canadian portion of the trail was christened Chilkoot Trail National Historic Site, one of several sites that compose the Canadian national park associated with the Klondike. But not until the centennial of the gold rush, in 1998, was the dream of an international park realized, when Klondike Gold Rush NHP and Chilkoot Trail NHS were merged to form Klondike Gold Rush International Historical Park. The Chilkoot Trail is a popular recreational trail among residents of Southeast Alaska and Yukon Territory. The trail also attracts many tourists from abroad. To manage demand, and to prevent overuse and maintain the remote character of the trail, the National Park Service and Parks Canada allow no more than 50 backpackers to begin the trail each day by way of a permit system. In return for these fees, both countries have full-time trail maintenance crews, ranger/warden stations, well-designed campgrounds, and have placed numerous interpretive signs adjacent to notable historical sites and objects. The "official" hiking season (when rangers are on-duty and trail crew is on-site) varies, but usually begins in late May and ends in early September. Peak demand runs from June through August. Avalanche danger lingers into late May, as well as large snow fields that slow progress, whereas September is associated with rain and colder weather. 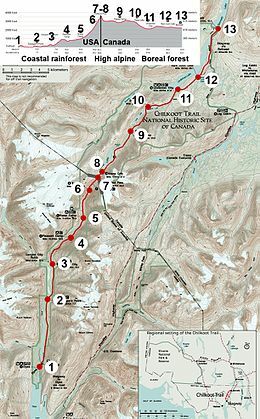 The Chilkoot trail features a number of natural and historical sites as shown on the map. By following the numbers on the map from south to north, the hiker will go along the same route as the old prospectors. The trip normally takes three to five days  and to stay for the night, a number of designated campground are made. The trail is roughly divided into three climatic zones: coastal rainforest, high alpine (above tree limit) and boreal forest. In the end it is connected to White Pass historical railway leading back to Skagway the modern port of the trail. In the following, the points of the map are highlighted with bold letters. The trail begins in Dyea, a ghost town and campground, 15 minutes from Skagway. From the trailhead, the route winds through coastal rainforest along to the Taiya River. The first campsite is Finnegan's Point. This stretch of the trail is in flat terrain with no substantial obstacles. The trail becomes noticeably cooler after Finnegan's Point owing to cool air sinking down from snow and ice fields in the surrounding mountains. Numerous streams also cascade down the mountain sides. This stretch of the trail contains the least amount of visible artifacts. The next camp is Canyon City. Many hikers, especially those desiring a more modest pace or those who have had a late start, stop at Canyon City the first night. The shelter located at Canyon City houses many gold rush-era artifacts. Close to the Canyon City campsite are the Canyon City ruins. Canyon City was a tent city during the gold rush and its ruins—building foundations, a large restaurant stove, a large boiler—are still visible. The ruins are accessible by crossing the Taiya River by suspension footbridge. After Canyon City ruins, the trail diverges away from the river for the first time as the river disappears into a small canyon (Canyon City's namesake) and climbs up valley wall, traversing sub-alpine forest. For many sections of the trail, old telegraph and tram wires are exposed adjacent to the trail. For the gold rush prospectors, this section of the trail was one of the most difficult. In winter, when the Taiya River was frozen, the gold rush stampeders could easily travel up the ice highway; however, in the summer this segment was described as "the worst piece of trail on the road, fairly muddy with many boulders and with some short, steep ascents and descents in and out of small gulches." The next landmark is Pleasant Camp. There is an informational trail sign at the original site of Pleasant Camp, a quarter mile before the present Pleasant Camp campground. Pleasant Camp marks the reunion of the trail with Taiya River and serves as a lightly used, small campground. From Pleasant Camp the trail is fairly flat and weaves through forest and over small creeks. The trail next comes to Sheep Camp, the last campground on the American side of the trail as well as the final resting stop before the trek up Chilkoot Pass. It is the largest of the campsites on the American side of the trail. After leaving Sheep Camp and before the U.S. ranger station, the trail passes through a large avalanche chute. The slide has wiped out all previously existing forest and leaves a young brushy and alder-dominated landscape. A short distance after the ranger station is a small museum of gold rush-era artifacts in an old cabin. Soon after leaving the cabin the sub-alpine forest slowly yields to a treeless alpine landscape that allows a grand view of the rapidly narrowing Taiya River valley. As the trail climbs in altitude, its path becomes more improved, often demarcated by yellow markers planted in snowfields. Within sight of the pass, and at the base of the "Golden Stairs" (the long difficult incline that leads to the pass), are The Scales. The Scales were a weight station where freight would be reweighed before the final trek to the pass. Often, Native packers would demand higher packing rates. The Scales also hosted a small tent city, including six restaurants, two hotels, a saloon, and many freighting offices and warehouses. The imposing Golden Stairs also prompted many would-be prospectors to turn around, often leaving behind their required ton of equipment. Because of this, and the snow's preserving properties, artifacts are prevalent at this altitude, including many remnants of wooden structures. After The Scales is the final push up to the Chilkoot Pass: the fabled Golden Stairs. The Golden Stairs acquired its name from the steps that prospectors painstakingly carved into the snow and ice of the pass and has retained the name ever since. At the pass proper, at the Canada–US border, is a warming cabin and part-time Parks Canada warden station. Occasionally, if a party is making poor time, the warden or U.S. ranger will offer the warming cabin as an overnight shelter so to not risk the group from being caught in the barren and exposed alpine landscape between the pass and Happy Camp. There are also many artifacts scattered about the Golden Stairs and ridge lines surrounding the pass, including a cache of intact (canvas, wood, etc.) prefabricated boats on the southeastern side of the pass. Stone Crib is situated a half mile after the pass. Stone Crib served as the terminus of the Chilkoot Railroad and Transport Company's aerial tramway, a huge rocky counterbalance for the tram. This function is still apparent today with the wooden structure well preserved by the snow. The trail continues to pass another couple of lakes—Long Lake and Deep Lake—before crossing tree line. Adjacent to Deep Lake, and amidst tree line, is another campground. The Canadian half of the Chilkoot Trail, in the rain shadow of the Coast Mountains, is much dryer, and pine forest, first appearing at Deep Lake, readily contrasts to the more lush temperate rain forest on the U.S. half before Chilkoot Pass. After the trail passes Deep Lake, the outlet river runs parallel to the trail for a short distance before entering a small canyon. Many boat and boat-related artifacts are visible in this area. The trail continues at a gentle decline until the turquoise-colored Lake Lindeman comes into view and the trail concludes its descent to the Lake Lindeman campground, the headquarters of Canadian trail operations. The trail climbs a steep bluff after Lindeman and offers an expansive view of the lake and surrounding forest. After Lake Lindeman, the trail passes Bare Loon Lake and the Bare Loon Lake campground. The trail diverges after Bare Loon Lake. One branch continues to Lake Bennett and the tracks of the White Pass & Yukon Route railroad. The other branch, the Log Cabin cut-off, connects with the Klondike Highway, but was closed by Parks Canada in 2010. Bennett consists of a campground, a White Pass and Yukon Route depot, several houses (all private property) belonging to White Pass employees or First Nations citizens, and the only gold rush-era building still standing along the trail today, the renovated St. Andrew's Presbyterian Church. Pilings from bygone piers dot the lakeshore and an assortment of cans and other metal artifacts are scattered throughout the woods. In addition to the camps, a U.S. Ranger Station is located north of Sheep Camp to present the history of the pass and inform about weather and trail conditions before crossing the summit. Bears are the primary safety concern in the park. It is very common for hikers to encounter them. Firearms are not permitted on the Canadian side of Klondike Gold Rush International Historical Park. Almost all parties take bear spray and/or bear bangers as repellents, but most importantly both sides of the park mandate smart bear practices. It is required to stow food in bear-safe locations. Weather and terrain also pose a challenge to hikers. There are few risks in the forest regions of the trail, however once the trail climbs into the alpine, weather and the elements pose more of a concern; the same does vertigo. Often the American ranger from Sheep Camp sweeps late in the day up to Chilkoot Pass to monitor for straggling groups that may not make Happy Camp and would be in need of emergency shelter. ^ Chilkoot Trail. Canadian Register of Historic Places. Retrieved 29 October 2011. ^ ProBoards: "Chilkoot Trail (AK)"
^ "Firearms in the park - Klondike Gold Rush National Historical Park (U.S. National Park Service)". www.nps.gov. Retrieved 2017-04-02. ^ Klondike Gold Rush National Historic Park online: "Ton of Goods"
Wikimedia Commons has media related to Chilkoot Trail.